I decided to close off my week with an invigorating and inspiring Jivamukti class with Frances last night. All was going really, spectacular even, until our last posture. I was too busy processing “find a partner” to realize what Adho Mukha Vrksasana was. “Great!” I thought, if I wanted a partner yoga class, I’d have chosen a partner yoga class, brought my own partner so I would not have to practice with a stranger. The other yogis around me seemed to be cringing as well. The girl next to me seemed cool even though she had that dear stuck in the taillights look on her face. I immediately decided I wanted to team up with her. We were around the same height and build so I figured that was a plus whatever we were going to be working on. We signlaed to each other with a nod like two rebels on a mission to get through this as quickly and smoothly as possible. As we did that, we both heard a hint of playful sarcasm in Frances’ voice, “wow, you all seem really excited about this handstand – good thing the door is locked”. Our jaws dropped. Jennifer, my new partner, looked terrified, I think I saw her scan the studio for the closest exit. 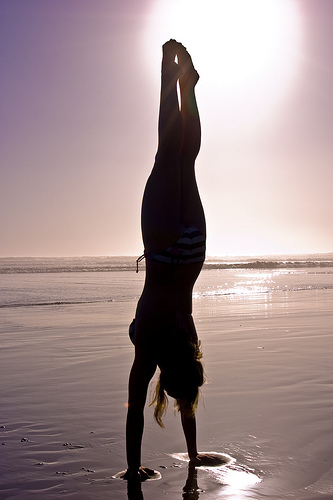 I had a flash of my last static handstand, three years ago which ended up in a sprained wrist and three weeks off work. I felt myself clench from within. No way I could go there again. I had been avoiding most level 2 classes for this reason, even though I can practice many of the postures, I wasn’t ready for this one again yet, or so I thought. “Breathe” I told myself, “you’re a different person that you are then and you’ve been training really differently.” I didn’t believe myself, mainly because I still use my forearm and elbows in side plank because I’m afraid to strain my wrists, in fact I had done that just 10 minutes prior in our plank routine. Anyway, it quickly became evident that Jennifer was panicked and she believed she could not do this. She too, was really worried about her wrists. I stepped up, “Look, yoga is about meeting yourself where you are, we’ll go at our own paces and if we can’t go all the way, that’s fine, we’ll celebrate how far we took ourselves. I promise I won’t let you fall” I told her. We were working with the wall for balance. I offered to go first. Jennifer would push against my leg extended outward so that I could leverage pulling myself up. As I came into the posture I realized I definitely had the strength I needed to support myself, and I could even draw deep into my abs to pull second leg up without Jennifer pushing it up for me. Strength wasn’t the issue, I realized, it was the fear of the unknown. Where was the wall? when was I going to reach it? Would the wall not meet me and I would thereby fall off the edge into another universe? I panicked without that sense of insecurity – it was a really metaphor for jumping into the unknown and trusting life to meet you where you are. And there was Jennifer’s voice, you’re almost there, just a little more, you’re doing amazing! I HAD TO trust there, she was the only concrete I had, standing upside down my legs to the sky with no solid ground to meet my feet. And I learned to trust, to rely on someone, something I don’t much of. I usually venture out alone and pull myself through and out of everything I wander into. I draw upon myself constantly. Last night, I drew upon Jennifer’s guiding voice. The wall met both my legs, I didn’t fall off the edge into a parallel universe. I felt immense joy standing there upside down, feeling all of my strength, my power and exploring a whole different perspective. My partner was amazed at how I was able to hold the pose, I could have stayed in it a lot longer but I figured don’t push your luck, you have to do it a second time, be nice to your wrists, this is their first time back. That part didn’t amaze me, it felt natural, but I was amazed at the huge leaps and bounds I’d just taken – leaping into the unknown, trusting my body, this total stranger and life; all three of them to meet me where I’m going and provide everything I needed to get there and be there, joyfully. Bring on the inversions, I’m definitely ready to leap! oh, and if you’re wondering how beautiful and sweet Jennifer did: she was awesome, she made it all the way up both times, she wasn’t ready to hold it yet, but she made it up and that itself is amazing, the mere fact that she tried despite her fear, was something to be celebrated. I have no doubt she’ll get there again and again!